This was an incredibly fun read that made me laugh loads thanks to Dan and Phil's humor that so nicely translated onto paper. As someone who really likes to watch their videos having the ability have something from them, especially in book form, standing on my shelf is really nice, which I guess is also exactly what they've been going for. For this review I will try to keep my inner fangirl at bay and try to be as objective and unbiased as possible. When the first YouTuber book wave hit the news I groaned inwardly because when I think of a book I imagine a novel and not a collection of stories, pictures, or pieces not even written by the YouTubers but someone else. 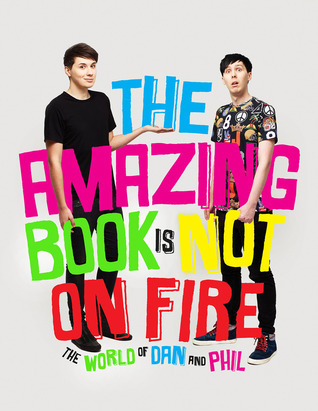 But, when I heard that danisnotonfire and AmazingPhil were working on a book I got really excited and hoped for it to be something fun. Luckily I got just that. I enjoyed this conversation type vibe that a big chunk of this book had going on because it almost felt like reading a transcript of their video(s). I also really liked how different their writing styles were, which was also underlined by two certain stories that can be found inside the book(those who have read it will know which ones I mean). Dan uses longer, wonderfully articulated sentences, whereas Phil's parts felt a bit simpler, typically Phil like (which will probably only make sense to those who've watched his videos), but funny and intriguing nonetheless. Another good thing was that despite the fact that, for example, I've seen almost all of Dan's videos, and a number of Phil's, I still learned so much new stuff about them in this book. I really enjoyed the way they described their University life and, once again, felt awe when reading that Phil is so smart and has a Bachelor and a Master. The format of this book was also quite fun. There were many colors used, many really cool and interesting pictures to look at, and the story about what really happened in Vagas was brilliant. Let's also not forget the part where they talk about the time they met One Direction. Even someone like me who isn't really involved in the One D world nor really listens to their music, I could feel the emotions that Dan and Phil were describing and I could perfectly understand them. I applaud them for that. All in all I think The Amazing Book is Not On Fire is incredibly funny, interesting, and immensely entertaining. I finished it in under twenty four hours because I could just barely make myself stop. This was definitely a YouTuber book that did not disappoint me, but rather made me want to pick up more of them, though I only think there is like one more out there that I really want to have. So if you're a fan of Dan and/or Phil, I think you're very likely to enjoy this read, and even if you're not, you could still give it a try even if only for the laughs and giggle. I give The Amazing Book is Not On Fire by Dan Howell and Phil Lester 5 out of 5 Stars.